← There is fat and there is fat. . . Sometimes those on the Elimination Phase of the TQI diet worry that they may become deficient in vitamin B because they are not eating many grains. Those worries are actually misplaced because it is near impossible to become B deficient while eating a healthy diet. First, the TQI diet does not elimnate grains as a choice for those who wish to eat grains. It definitely strictly limits the amount of refined grain in the diet but this is good from the stand point of vitamin B: Refining removes vitamin B from grains and that is why people living on a diet of white rice often developed beri-beri, a disease caused by a lack of B1. Of course, refined flour today is usually “enriched” with vitamin B but the enrichment process still leaves you with less than what the original whole grain would have provided. On the TQI diet, people only eat whole grains. While the relative proportion of whole grains is fixed, the TQI diet allows people to eat as much whole grains as they choose. More importantly, humans can survive quite well without any grains at all provided they eat a healthy diet. Our hunter/gatherer ancestors would not have consumed much grain at all. Before humans developed agriculture, grain plants did not hold their seeds tightly on the plant. Instead, many plants evolved shattering techniques that caused the seeds to fly off the plant to disperse them far away from the parent plant. As humans began to collect and plant seeds, they selected plants whose seeds were easier to gather. 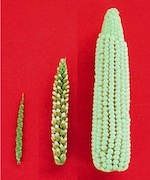 Compare a picture of the seed head of wild corn (teocinte) with today’s corn. Our corn holds its kernels tightly on the cob; in fact, they often sprout on the cob itself. Teocinte does not have a “corn cob” as we know it. So, hunter/gatherers had to be able to survive well with little grain in their diet. Our ancient ancestors were able to survive well because so many other foods besides grains provide us with B vitamins: Meats, fish, poultry, eggs, beans, nuts, and leafy greens are all excellent sources of B vitamins. They are equal, and in some cases, superior to grains in terms of B vitamins. Hunter/gatherers did no doubt experience stress and stress does deplete B stores, but they did not indulge in many other activities that deplete B vitamins: Eating simple sugars and refined grains, exposure to toxins, drinking caffeinated beverages, and taking a wide variety of drugs. Today, many people live on refined grains and simple sugars and do not eat the fish, nuts, seeds, and leafy greens that quite amply provide us with B vitamins.Today, many people are under a great deal of emotional and economic stress. Thus, it is the modern diet and life style that is most likely to cause a deficiency in vitamin B in the Western world. It is simply silly to worry that a diet rich in fish, eggs, nuts, seeds, poultry, leafy green vegetables and/or fruit will cause a vitamin deficiency. While people may choose to eat whole grains — and many on the TQI diet do enjoy whole grains such as quinoa and brown rice — many choose not to eat much in the way of grains, instead perferring seeds, nuts, eggs, fish, and greens. Foregoing grains makes it easier to maintain a better balance of omega-6:3 fats because of the higher omega-6 fats in many grains. Even those who shun grains will get ample amounts of the B vitamins on the TQI diet because: A cup of lentils or green peas has as much B1 as a cup of brown rice. A half cup of spinach or six spears of asparagus provides more B2 than a slice of whole wheat bread. Three ounces of salmon or chicken provide more B3 than a cup of cereal or pasta. (Non-meat eaters get an equivalent amount from lentils and nuts.) You get twice as much B5 from a half cup of broccoli than from a slice of whole wheat bread. An avocado provides ten times as much as a slice of whole wheat bread. A medium banana has as much B6 as a cup of cereal. A half cup of garbanzo beans, spinach or asparagus provides at least twice as much folate as a cup of rice or a slice of bread. A cup of cauliflower provides as much biotin as whole wheat bread; three ounces of salmon or an avocado provides vastly more. The only reliable sources of B12 are animal foods; grains do not provide that vitamin, which fortunately takes many years to deplete. Choline is another important nutrient often included in considering the B complex: A large egg provides as much choline as a cup of wheat germ. To become B deficient, even sub-clinically, you must instead eat lots of simple sugars, refined grains, alcohol and certain chemicals while under large amounts of physical and/or mental stress. People on the TQI diet do not eat those foods and help reduce physical stress by providing the body with the nutrients they need. Given the prevalence of B vitamins in whole foods, there is simply no way to eat healthfully, yet build toward a deficiency. This entry was posted in Food and tagged B vitamins, diet, food, grains, hunter/gatherer, sources of B, stress, white rice. Bookmark the permalink. Very interesting. So what is the best way to insure we are getting enough B12? There is a general consensus that we do not get B12 from plant foods, so not really relevant to whether you need to eat grains or not. To get B12, you either eat animal products periodically or you take a B12 supplement. Interesting fact: B12 is quite long-lasting nonetheless it seems that many meat-eating Americans are deficient in this vitamin so there likely is more to this issue than simply occasionally eating things like fish. I thought we needed grains also for the fiber they give. If someone is not eating grains much, should they increase the amount of fruit or nuts they eat? Fiber is one of the benefits we get when we eat grains but grains are not our only source of fiber. All plant foods contain fiber so if you eat other plant foods you should get enough fiber. This site: http://www.todaysdietitian.com/newarchives/063008p28.shtml (and many others), list the fiber content of various foods.